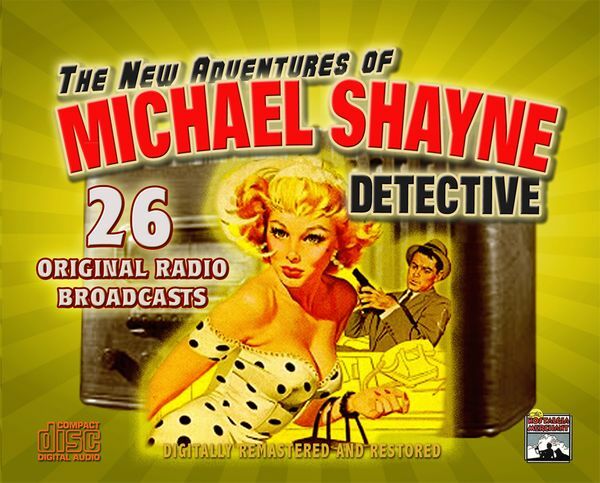 The New Adventures of Michael Shayne debuted on Mutual in 1948. This collection includes all 26 episodes of this series. Michael Shayne, "the reckless, red-headed irishman" was a popular hard-boiled detective created by crime novelist Brett Haliday. Mike blew into Miami just after WWII, making crime pay by fighting it with a license and an attitude. The New Adventures of Michael Shayne starring Jeff Chandler, debuted on Mutual in 1948. Mr. Chandler left the program after 26 episodes due to scheduling conflicts. This collection includes all 26 episodes. EPISODE TITLES: Premier Episode - 10-14-47; Case of the Hunted Bride - 7-22-48; Case of the Blood-Stained Pearls - 7-29-48; Case of the Phantom Gun - 8-6-48; The Hate That Killed - 1948; Case of the Gray-Eyed Blonde - 1948; Case of the Model Murder - 1948; Case of the Generous Killer - 9-2-48; Pursuit of Death - 1948; Case of the Crooked Wheel - 9-18-48; Case of the Wandering Fingerprints - 1948; Case of the Purloined Corpse - 1948; Case of the Left Handed Fan - 10-16-48; Case of the Deadly Dough - 1948; Case of the Popular Corpse - 1948; Case of the Bayou Monster - 1948; A Problem in Murder - 11-13-48; Case of the High-Priced Twins - 11-20-48; Case of the Carnival Killer - 11-17-48; Case of the Constant Companion - 12-4-48; Case of the Borrowed Heirloom - 12-11-48; Case of the Eager Victim - 1948; Case of the Corresponding Corpse - 1948; Case of the Mail Order Murders - 12-32-48; Case of the Phantom Neighbor - 1949; Case of Tahlani's Tears - 1949.